The Heritage Lottery has funded artist Jonathan D. Boast to commemorate the 90th Anniversary of the burial of the Unknown Warrior with a sculptural monolith. The Unknown Warrior Project aims to teach new generations about the significance of Remembrance Day and involve local communities with their shared histories. Jonathan has been working closely with the Dover War Memorial Project, Westminster Archives, Westminster Abbey and more than 100 Scouts and Brownies to design and create a window into British history. The eight-panelled monolith will stand over 2m tall and be on display in Westminster Abbey from 2nd November 2010. On the 10th of November 1920, the HMS Verdun returned to England with the body of one soldier who symbolically represented all those who had died in the Great War, but whose place of death was unmarked. His body was transported from Dover to London via rail and laid rest in Westminster Abbey on Armistice Day 1920 in what is now one of the most visited war graves in the world. This literal, and figurative, double-sided window tells the stories of six servicemen who lived and worked along the casket’s rail route. Such men include famous Chelsea player Bob ‘Pom Pom’ Whiting of the 17th Middlesex Footballers Battalion and 2nd Lieutenant Walter Tull, who played for Tottenham Hotspur and was the first black infantry officer in the British Army, also nominated for the MC. Coinciding with the 90th anniversary of the burial of the Unknown Warrior, the Football League Trust will also unveil a memorial in France in October 2010 to the men of the 17th Middlesex Football Battalion who died in the Great War. Jonathan helped bring the personal stories of these six soldiers to life for the Scouts and Brownies in Dover by using printed archival documents and photographs for one side of the monolith. The opposite side of the window portrays a British soldier standing on the cliffs of Dover as he watches the HMS Verdun’s. A bright Poppy falls in the background sky like the setting sun, as additional surrounding iconography helps to represent the grief of an entire nation. Thus the printed and painted imagery symbolically merge to bring together the themes of the work; individual and national mourning and our pledge to remember. Along with Jonathan’s work, archive material from the Dover War Memorial Society, Westminster Archives and Westminster Abbey will be used to tell the story of the Unknown Warrior in an exhibition that will be on display in Westminster Abbey from 2nd November 2010 to mark the 90th anniversary of this event. Pupils from London and across the South East will attend special services and workshops hosted by the Abbey’s education department. The entire exhibition will then tour sites linked with the events, including Dover Town Hall/Discovery Centre, Westminster Abbey, The City of Westminster Archives, Medway Archives, The Royal Artillery Museum, Kent & East Sussex Railway Museum and Port of Dover. 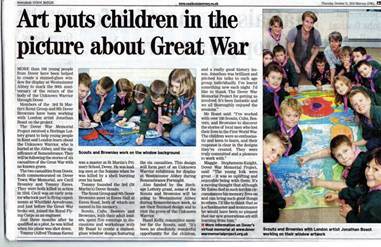 Below: Photos from the workshops with Dover Scouts, Beavers, Cubs and Brownies and press; Your Dover, Express, Mercury.